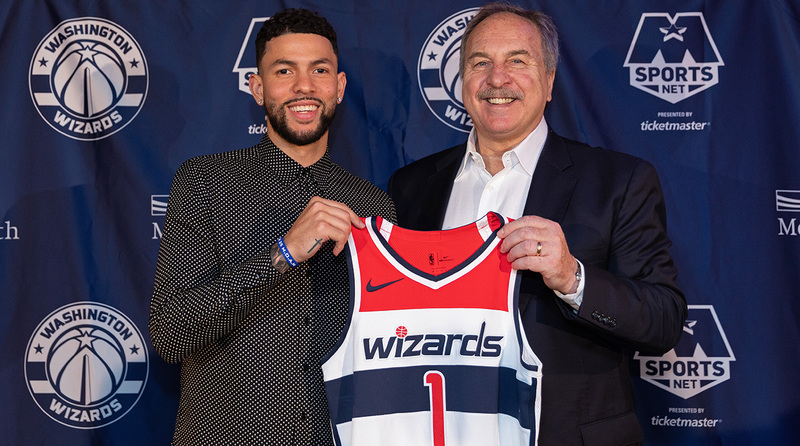 From a talent acquisition standpoint, this has been a better offseason for the Wizards than most years—but do any of their recent additions get them closer to where they want to be? Inertia is the NBA's silent killer. Whenever a winning team tries to run it back for another season with the same core, they pay the price: first in escalating deals for the same talent, then in the opportunity cost of all the moves not made. Continuity—for all its benefits—can be logistically inhibiting. Those franchises operating near or over the salary cap are highly incentivized to re-sign their own players, as it would be far more difficult to replace them. What a team can offer too often becomes what a team must offer. In just a few seasons, that intriguing young team that crashed the playoffs can stall out completely from financial gridlock. This is where we find the Wizards, who over the past five years have put together a roster just good enough to pay for it. Their problems are bigger than any one deal; whereas some franchises struggle under the weight of a single mistake, what ails Washington is more layered. It's not Otto Porter's deal (worth $107 million over four years) that's at issue, but the fact that he's the team's third max player. It's not just Ian Mahinmi's four-year, $64 million contract that's weighing things down, but the cost that comes from blowing a vital opportunity. This is the sort of record that leads a team with years of bubbling resentments to acquire some of the most frustrating players in the league. From a talent acquisition standpoint, this has been a better offseason for the Wizards than most. Dwight Howard is set to sign for the mid-level exception and Jeff Green will come on for the veteran minimum. Marcin Gortat—made expendable by Howard's arrival—was flipped for Austin Rivers. Some service was paid to every one of John Wall's end-of-season criticisms. Washington got its more athletic center and its backup wings, or at least the best version that could be had with a monkey's paw. The Wizards' existing identity was already one of rancor—sometimes with a passive-aggressive edge. Now they add a former star center whose act has long since worn thin, a guard who tends to get on the nerves of many of his coworkers, and a forward who has exasperated a fifth of the league with his inconsistency. These are the compromises a team makes when it's all but out of options, and, typically, they are harbingers of the end of an era. But this is Washington, where the front office has been given uncommon latitude in their efforts to make the most of this particular core. The result is a grumpy, oft-injured group that should make the playoffs—if only because some teams in the East will have to. They will be dazzling at times, and implosive at others. The Wizards will likely win more than the 43 games that they did last year, and yet functionally they will be no closer to Boston, Philadelphia, and Toronto. Then, as they enter next season, they'll have over $92 million committed to just three players and the majority of a roster to re-sign or replace. Competitive momentum—even the kind Washington has experienced in fits and starts—has taken its toll. Wall and Beal were too good to let go, and Porter too promising. Yet their collective salary creep, along with the not insignificant contracts for players like Gortat and Markieff Morris, made more dramatic moves difficult. There was a lingering sense that if the Wizards could only stay healthy, they could challenge the better teams in the conference. First it was the Heat and the Pacers, then the Hawks and the Cavs, and now the Celtics and the Sixers. Given where Washington is now, it's hard not to dwell on the deals that went nowhere: not just the signing of Mahinmi, but of Jason Smith, Jodie Meeks, or Andrew Nicholson, among others. One would hope that the fate of a team wouldn't hinge on its use of the taxpayer mid-level exception, but sometimes it does. The details matter—even more so when they represent a team's best chance of improving the roster. The difficulty of that shouldn't be lost on anyone. Some teams do such incredible work on the margins as to make it look easy. The reality is that teams are competing for the same players to fill their cap exceptions and final roster spots, creating a crunch for bargain talent. Without the track record, the cultural appeal, or the flexibility to make bigger offers, Washington rarely gets the inside track on those free agent pursuits. Teambuilding is hard. Not only does it come down to getting the right players, but the right timing, the right personalities, the right planning, and the right luck. Even drafting Wall, Beal, and Porter over a span of four years isn't nearly enough. Washington's moves this summer illustrate that vividly. The finances of keeping the roster intact from one set of contracts to the next has proven suffocating, which makes the additions of Howard, Rivers, and Green something of a gasp. These aren't bad moves under the circumstances. They're simply bad circumstances.